Marble is a nonfoliated metamorphic rock resulting from the metamorphism of limestone, composed mostly of calcite (a crystalline form of calcium carbonate). Etymology: The word “marble” is colloquially used to refer to many other stones that are capable of taking a high polish. 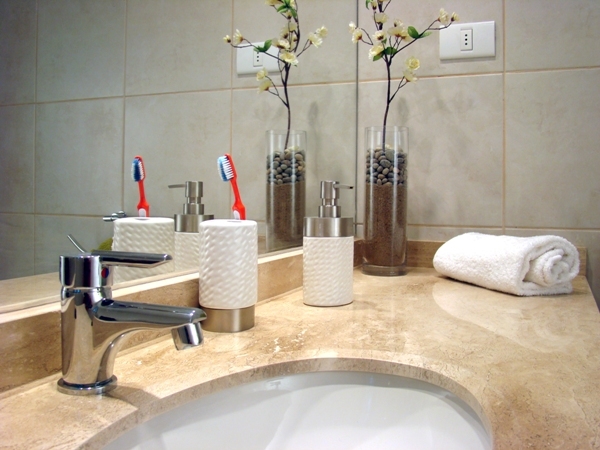 Our most commonly requested service is marble polishing. In some cases you may merely need to polish your marble floors to achieve a shine like new providing it has been well maintained. For our clients who like their marble to look better than new, inquire about our Diamond Polishing service. Our Diamond Polishing is our elite service which leaves your marble looking like a glass mirror for a fraction of the cost of a newly installed marble. Noticed some of your tiles are higher than others? Do you want your floor flattened to improve the esthetics, keep from chipping the edges, and facilitate marble cleaning? Peak Floor Solutions can grind away the excess marble to restore a flat level surface using the latest state-of-the-art machinery in conjunction with diamond abrasives. Have you noticed dull areas in your traffic areas? This is typically associated with what is commonly referred to as wear patterns, scratches, etches and so forth. Peak Floor Solutions can repair these surfaces by either honing or polishing your marble to eliminate these blemishes. The surface is then polished to the desired finish leaving you with the memories of your new floor once again. Have a chip, crack or broken marble tile? Peak Floor Solutions often times can repair your tile and blend it in with the surrounding tiles to match the surrounding surface. Without replacement tiles available, we grind a piece of marble and mix it into a clear epoxy for a very hard to spot repair. Your grout unmistakably influences how your floor, counter-top or other surface will look in the end. Peak Floor Solutions can replace, restore or repair grout as the need dictates to provide that finished look to your surfaces. You deserve to have your floors, counter-tops and other natural stone and tiled surfaces looking beautiful and elegant again. Professionally clean and enhance your surfaces so you can enjoy the everlasting beauty of your polished marble tile. If your having problems with tile and grout cleaning, or natural stone …we will get it looking clean and new again. That’s a promise! Give us a call today at (770) 499-1151 or click here to receive your free, no-hassle quote for service.